If you haven’t started following wrestling, now is a great time to start. Just before the Thanksgiving holiday, the Wesleyan wrestling team traveled to Springfield, Mass. for the Doug Parker Invitational to get their first title of the season. Behind three individual titles, the Cardinals tallied an impressive total of 125 points, surpassing Little Three rival Williams and 14 other teams to claim victory. Of the 14 wrestlers sent to the tournament, eight members earned the status of place-winners. Carter Armendarez ’18 was dominant again as he claimed the championship in the 149-pound division for the Cards. The 2017 NCAA Championship qualifier opened up by pinning Denver Dorsainvil of New England College in just 52 seconds. He then made his way to the final by sending three more opponents home mercilessly. In the championship, he ground out a 6-2 decision over Jojo Gonzalez of Springfield College to kick off Wesleyan’s winning streak. Refusing to be left behind, Devon Carrillo B.A. ’17 M.A. ’18 made it to the championship match in the 197-pound division after defeating four opponents from Bridgewater State University, Trinity, Plymouth State University, and Springfield College. He faced the fourth-ranked wrestler in the country, Etiini Udott, in the final. Carillo, an All-NEWA wrestler, showed great strength and patience in a close a 6-4 decision. Similarly, Isaiah Bellamy ’18 claimed glory for Wes in the 285-pound division, defeating challengers easily and winning by pinfall in 5:45 against Joe Fusco of Springfield in the final. Bellamy has now won two titles in the two tournaments he has competed in, hinting at a successful season to come. 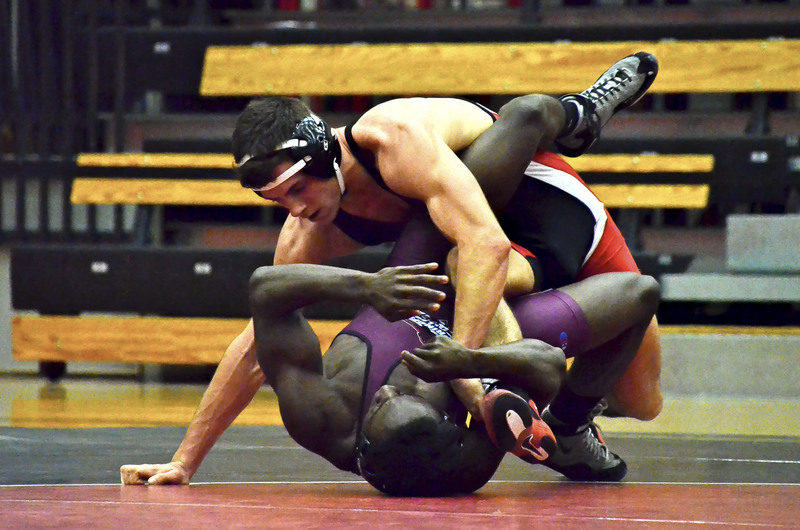 The Red and Black also had a strong showing in the 125-pound weight class. Amir Daouk ’20 and Zack Murillo ’19 took third and fifth, respectively. The Cardinals also continued to excel at 133 pounds, where Tristan Stetson ’20 came in fourth place. At 184 pounds, first-year Simon Chee claimed sixth place. Although these wrestlers’ successful starts did not result in titles, they worked hard to come up in the consolation bracket to not only earn themselves respectable positions, but also crucial points for the team. Now, the Wesleyan wrestlers are preparing for the RIT Invitational to be held in Rochester, NY on Dec. 2. At one point, the tournament was thought to be “the promised land” for the team: they claimed the title in 2012 and have produced several second-place finishes in the past. However, the Dirty Birds finished eighth last year as they suffered from road bumps like their captain’s injury. They hope to return to glory this year and believe focusing on the intense pressure inherent in their sport will pay off. As you walk into the wrestling room in the Freeman Athletic Center, a sign printed with “Welcome to Dreamland” greets you, motivating the wrestlers. Clearly, this team does not take their sport lightly, and there are many aspects of wrestling that have an effect on the everyday lives of wrestlers. For instance, in order to fit into their weight class, wrestlers often have to engage in extreme eating habits to quickly lose weight before matches. Restricting their food intake is just the beginning, as some choose to wear bulky clothing to increase their body temperature in hopes of sweating out the extra weight that could disqualify them from their weight class for upcoming tournaments. Luckily, the team can use their strong camaraderie to help them get through these challenges. Armendarez is looking forward to the rest of this season, citing last season’s success. If Armendarez continues to claim titles this season, despite all of the hardships he faces as a wrestler, he will head to Cleveland, Ohio for the NCAA Division III championships next March. And, hopefully, some more Cardinals will join him there as they pursue a national title. Health is the first foundation of this sport. Do you see it?